Mozilla decided to change the cookie management options in Firefox 60. 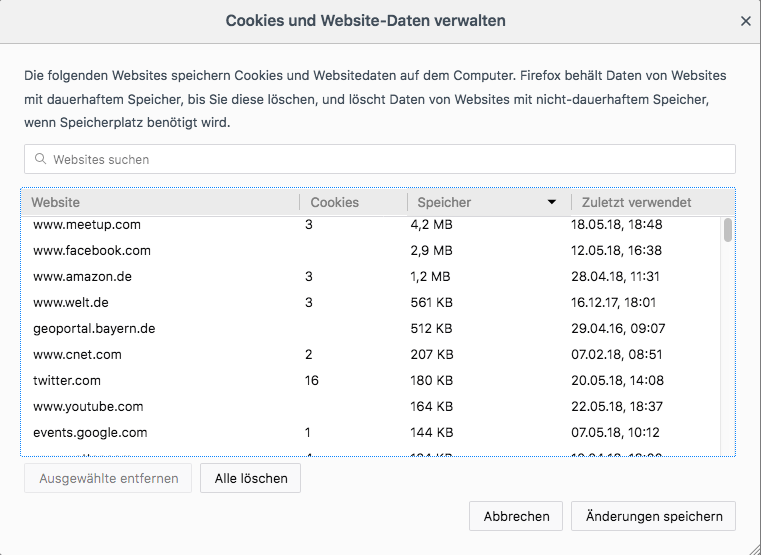 Now you can only see how many cookies a site created and how much space a site occupies on your computer. Fresh install in the simulator To make sure that your UI tests start with a fresh install of the app on the simulator you can uninstall the app after building the UI tests: Open the project settings, go to the UITests target and in the section “Run Script” add the following command line: xcrun simctl uninstall booted com.vvse.toiletmap Use “accessibilityIdentifier” or “accessibilityLabel” to identify UI elements If possible use accessibilityIdentifier or accessibilityLabel to identify a UI element. We have two git repositories “AlphaBeta_iOS” and “AlphaBeta_Android” that we would like to merge them into one new repository “AlphaBeta”. Each existing repository should get its own sub folder named “iOS” and “Android”. The history of both repositories should be preserved.